PHOENIX — Russell Wilson’s “No Time To Sleep” mantra apparently doesn’t just apply to football season. The Seahawks quarterback has been keeping a whirlwind schedule this offseason that has included a trip to Brazil two weeks ago, two days in spring training with the Yankees the weekend before last, and some working out at USC last weekend. He then made a brief appearance in the Seattle area Sunday night, attending Michelle Obama’s “Becoming” talk at the Tacoma Dome with his wife, Ciara. The two then hopped a plane and appeared at the NFL league meetings Monday morning, giving a talk in front of about 200 spouses and guests with a main theme of balancing personal lives and high-profile careers as part of the league’s The Playmakers program. Wilson is one of 13 current or former players making appearances at the league meetings — Arizona receiver Larry Fitzgerald was among those at a talk about the league’s social justice initiatives on Monday. Wilson didn’t say it, but judging by his Twitter account, he may well have been headed next to the Bay Area to see his sister, Anna, play in an NCAA women’s basketball tournament game Monday night for Stanford against BYU. What Wilson apparently hasn’t done yet is have any substantive talks with the Seahawks about his future — sources have indicated there have not been any real discussions (though Wilson may have sneaked in some time here to talk to coach Pete Carroll and/or general manager John Schneider on Monday). That’s not unexpected — the Seahawks typically wait until late spring/summer to begin negotiations with players about extensions of contracts that have a year remaining. Wilson’s runs through the 2019 season. That time, though, is drawing nearer, with the Seahawks through the significant part of the free agency signing period and now a month away from the NFL draft, which is April 25-27. Sometime after the draft, the Seahawks and Wilson’s representatives — his agent is Mark Rodgers — could begin talking seriously about his future. 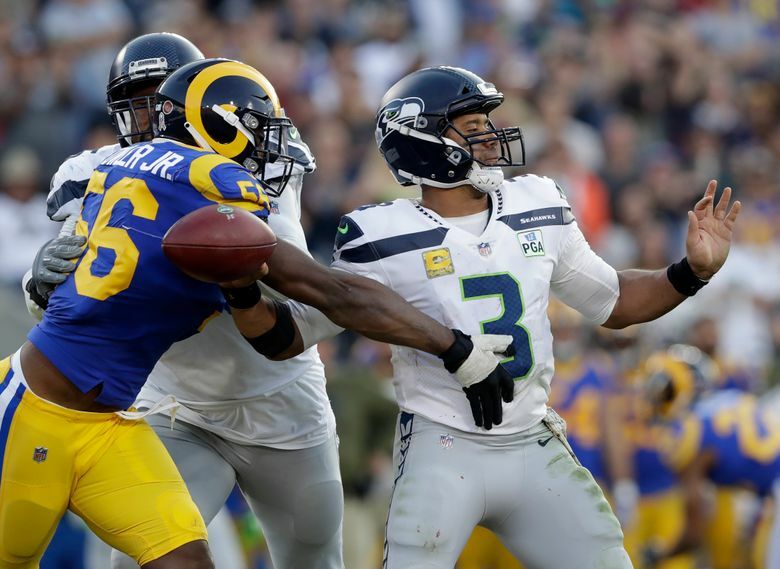 A franchise tag in 2020 that would pay Wilson at least $30 million for that one season could be an option that both sides would accept considering that is the final year of the league’s current collective bargaining agreement (teams can also use both a franchise and transition tag that year). Or the Seahawks could blow Wilson away with the kind of long-term offer that would be impossible to turn down, such as the $40 million a year suggested last week by Bucky Brooks of NFL.com — Wilson isn’t likely to accept anything that doesn’t top the $33.5 million per year salary of Green Bay’s Aaron Rodgers, which is the highest in the NFL, especially with the uncertainty of where salary cap numbers will go under the new CBA. But Monday showed anew Wilson is hardly just buying time until then.